There has been established an optimal type of spheroidizing inoculants and a method of its introduction to the melt. It is shown that the largest amount of spheroi-dalgraphite (SG) of regular shape can be obtained by treating the melt with Mg-containing master alloys by the MDS technology, and by introducing a Cerium additive MC-40 under the melt stream. Key words: inoculants, methods of their introduction to the melt, pyroeffect, spheroidal graphite. The article considers the method of obtaining the cast bimetallic stamps by directional crystallization in the conditions of intensified cooling. The benefits of using the developed aluminized iron as a support layer for a bimetallic snap press are also described. Key words: the crystallization, alloying elements, snap press. Budanov E.N. Efficiency of use of two-place moulds by production of railway castings "Frame and bolster"
Organization of foundry production of such responsible castings as steel frames and a bolsters for freight cars should be carried out by experience of really executed successful modernization projects of other car-building plants. The article gives an explanation of use of a two-place moulds for economically effective foundry production. Keywords: steel railroad castings, Vacuum-process, effective foundry production. 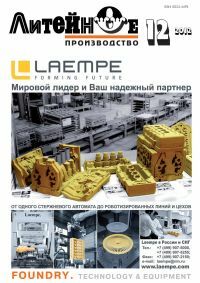 At the foundry "OMZ Liteynoe proizvodstvo" the patented molds and cores facing mixture for complex steel castings was introduced. It is based on chromite sand HEVISAND ®. Obtained results help to improve the quality of castings, and reduce the cost of the production. Key words: facing material, chromite sand, refractory additive, quality of castings. Vakuum formes began in the early seventies of the last century, as an alternative environmental threat from chemicalization foundry. However, it was not possible to obtain and vakuum forming rods for mass production. It had to use environmentally hazardous traditional rods. Frozen sand-clay rods organically combined with the rods for vacuum forming. Designed mixture, allowing the rods to produce frozen for over an hour is not losing the required technological properties in vacuum formes. Key words: frozen cores, heat exchange, structure, shrinkage porosity, clay-bonded sand, vacuum-film cores. Key words: forming roll, casting mold, melt, computer program, thermophysical properties. Computer designing application in ProCast program package for casting with exclusive performance requirements in casting by the consumable patterns is discussed in the present work. Key words: computer designing, ProCast, investment process of casting. The main subject of this report is a problem of historic bell reconstruction (remake) on the example of Moscow Danilov monastery. It submits (gives) a comparison of characteristics (data) of the old set, returned from Harvard University (USA), and the new set of bells, founded instead of it at "Vera" foundry in Voronezh city, such as: weight, great (lower) diameter of the bell, decoration and acoustic aspects. There is a conclusion, that the pure copy of bell sets at one time by both outer parameters and acoustic aspects is impossible. Key words: bell, set of bells, historic bell, chimes, reconstruction (remake, coping), Danilov monastery, Harvard University.